Who Are These Old Ham Radio Guys? 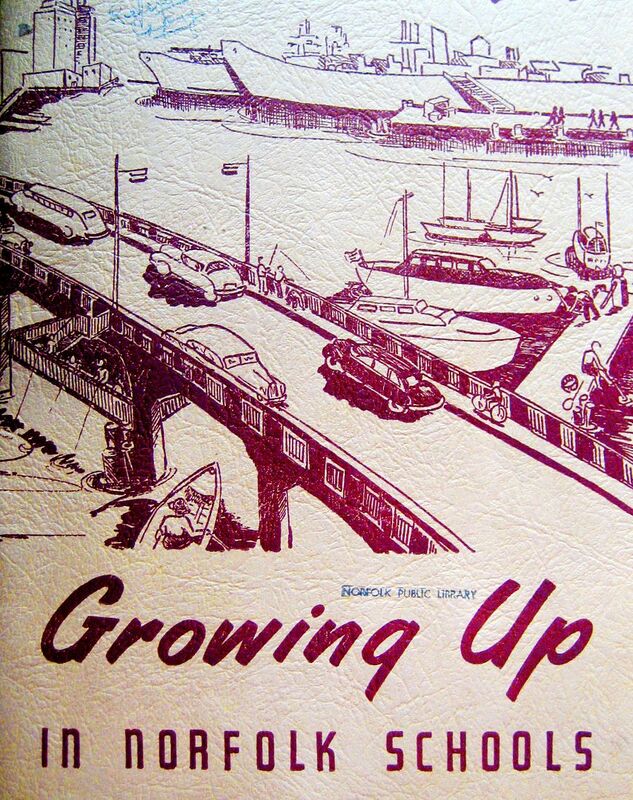 While doing some research on Norfolk’s historic architecture, my friend Bill at the Sergeant Memorial Room (Norfolk Public Library) found this old booklet (dated 1951) for me, promoting Norfolk’s public schools. 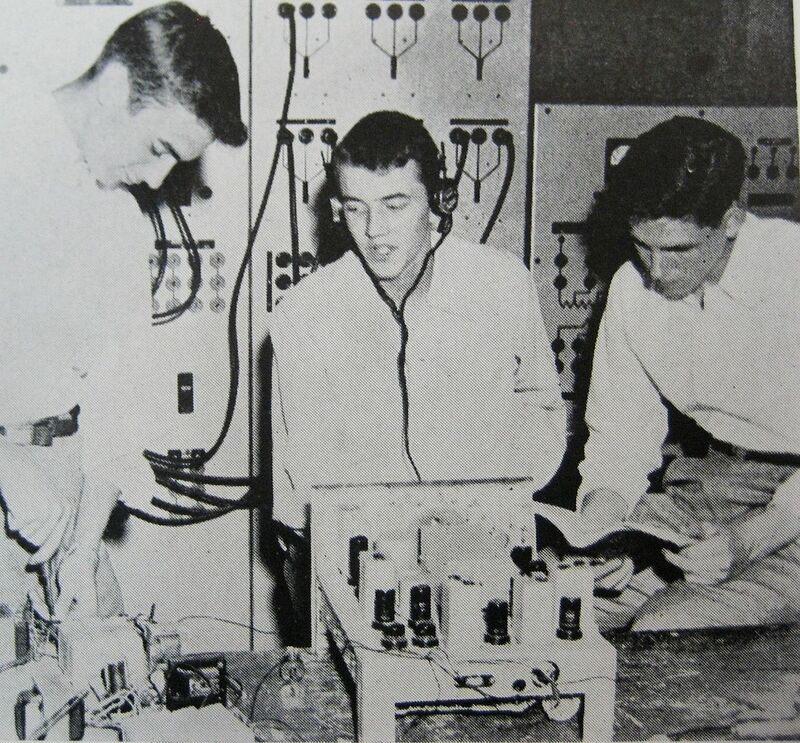 One of the pictures showed three boys working on what appears to be an old Ham Radio set. It sure would be fun to figure out who these boys are, and if they remained interested in Ham Radio through the decades. Who are these guys? 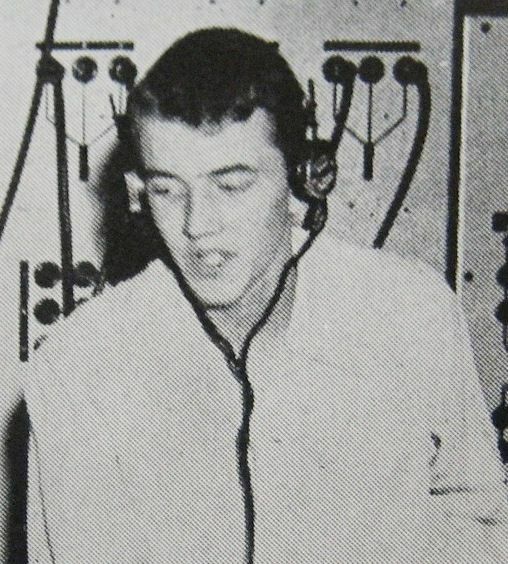 This picture appeared in a 1951 promotional brochure for Norfolk Public Schools. No name or photo credit was given. I'm not even sure which high schools were in existence in Norfolk in 1951. If they were juniors or seniors in 1951, they'd be 79 or 80 years old today. Someone must know who this young fellow is! This is the cover of the brochure which featured the young men shown above. 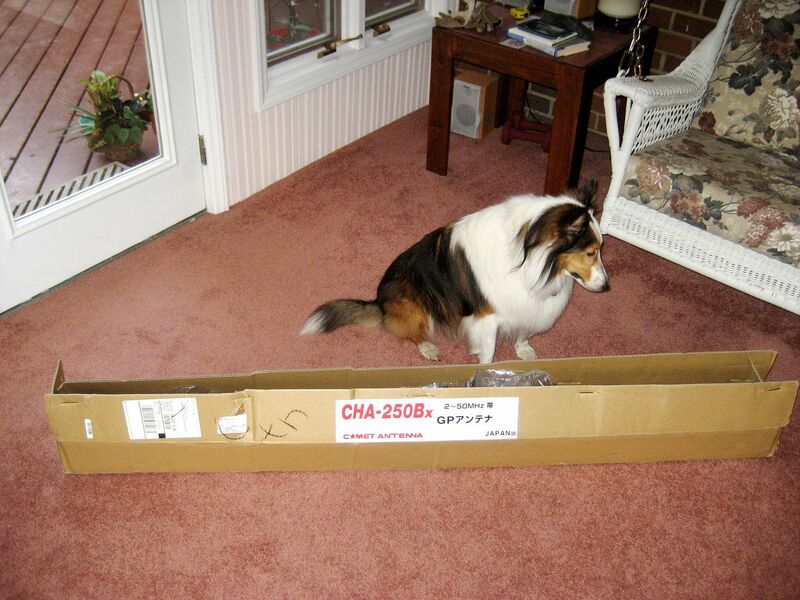 On a more modern note, Teddy the Wonder Dog examines the new Comet CHA-250Bx antenna that arrived Friday afternoon. She's puzzled by the size of the resistor at the end of this 23' vertical antenna. If those boys above could look into the future and see Ham Radio today, they'd be shocked to know that in 21st Century America, Japanese-made radio products are considered to be top notch. 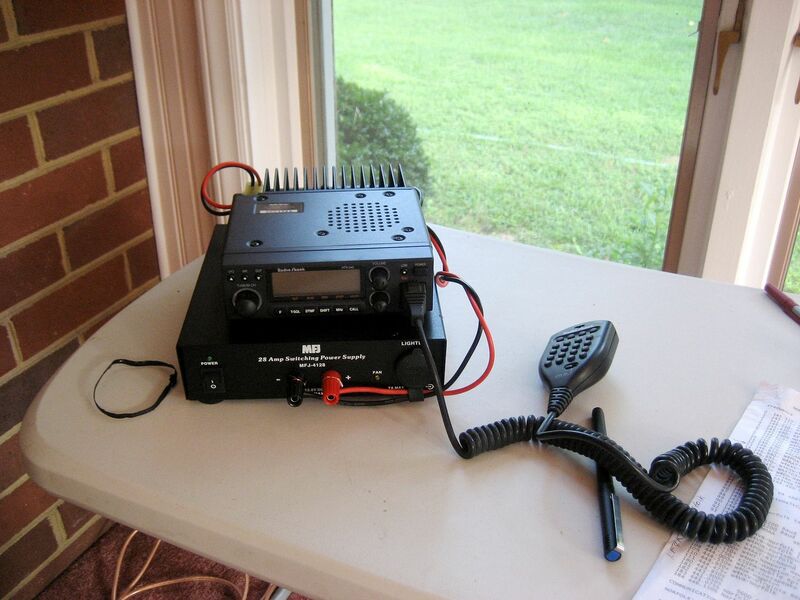 To learn more about Ham Radio in Norfolk, click here. 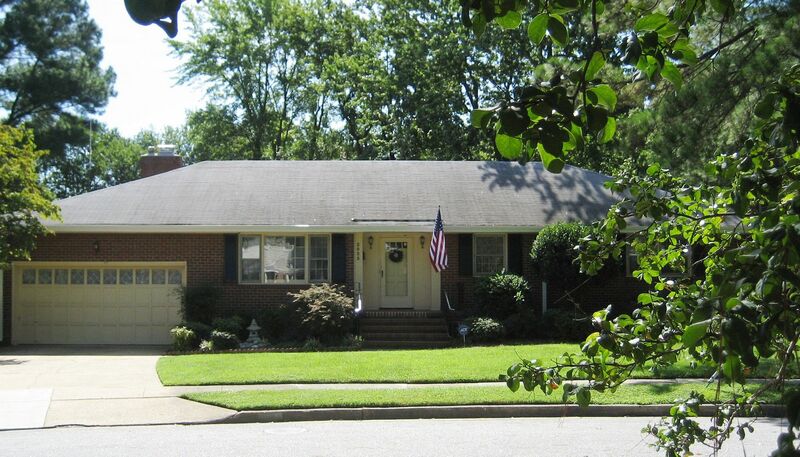 Want to read more about the Sears Homes in Norfolk? Click here. This weekend (September 15/16) there was a big Ham Fest (for Ham Radio enthusiasts) at the Virginia Beach Convention Center. This morning, I was one of about 40 people who gathered in an upper room sitting for a Ham Radio licensing test. In March 2011, I obtained my Technician’s License. And better yet, of the 35 questions on the test, I got 34 right!! It’s been a happy day. With this new license, I’m now legally empowered to fiddle around on HF frequencies, which opens up a whole new world. VHF and UHF frequencies are principally line of sight, but on HF, short radio waves can skip thousands of miles, reflecting (and bouncing) between the mirror-like ionosphere and the earth’s surface. Radios producing as little as five watts (which is very, very low power) take advantage of this “propagation” (as it’s called) and can send signals from Norfolk to London (and beyond!). Now, with my Certificate of Successful Completion of Examination (CSCE) in hand, I’m free to cruise the radio bands of HF. There’s just one last little obstacle: Lucre. After the test today, I descended to the main hall of the Convention Center and attended the Ham Fest, which is a massive display of vendors of radio equipment. Based on what I’ve learned, I’ll need to gather up several hundred dollars to buy a new radio that complements my new radio privileges. Until then, I’m still having a lot of fun playing around on what’s known as the “2-meter band” (VHF). 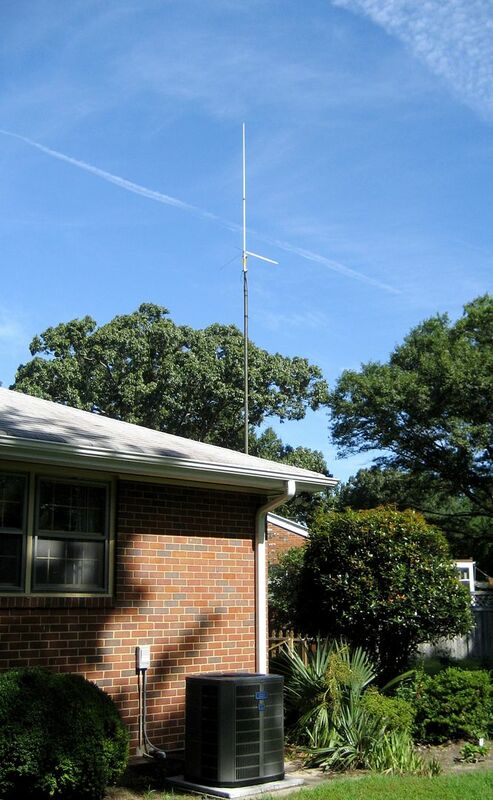 Thanks to my beautiful eight-foot Diamond X-200A, a dual-band vertical antenna (standing at about 30′ high outside my brick ranch), I’ve successfully tuned in stations up to 158 miles from my home in Norfolk. Who knew Ham Radio could be so much fun? To read more about my experiences with Ham Radio, check out Part I, Part II, Part III, Part IV, and Part V of this series. Click here to take a look at the General Test. As someone with no background in electrical components, I found it a bit challenging! My ham radio station is pretty modest. That's a hand-held five-watt, dual band Wouxun on the table, sitting next to a Radio Shack 10/45-watt HTX-212. 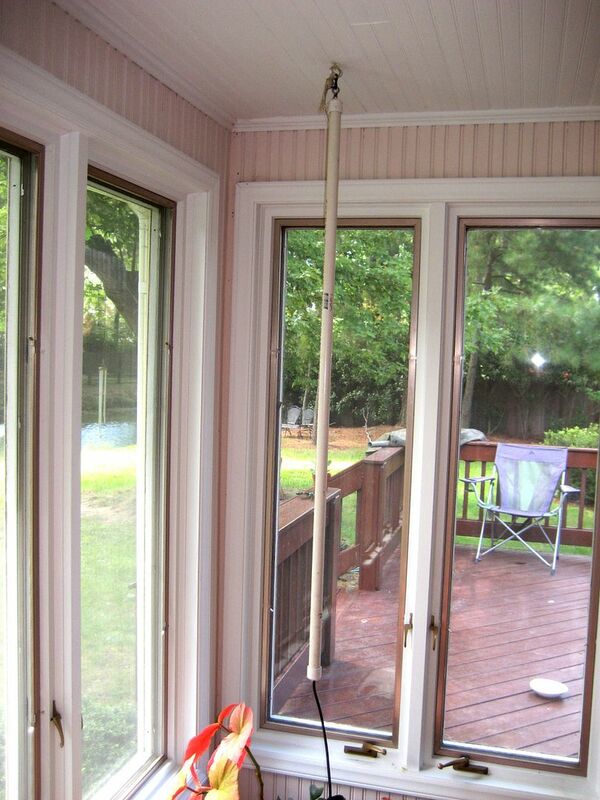 A J-pole antenna hangs from the ceiling. This device (hand-crafted by Mike Neal) is a little marvel. Using only this antenna, I can pick up a strong signal in Kilmarnock, about 75 miles from my house. The first Radio Shack two-meter radio I used was generously loaned to me by the RASON Ham Radio group here in Norfolk. I was so enamored of its countless charms and ease of use, that I went looking on eBay for one of my very own. The one I found is an HTX-242, which is (as far as I can tell) identical to the 212, but maybe a little tiny bit newer. The HTX-242 is sitting atop an MFJ 28-amp power supply. A list showing the two-meter repeaters in the Hampton Roads area sits to the right. Ebay - how do I love thee? Let me count the ways. The first thing I learned about Ham Radio is it can be an expensive habit! Thanks to eBay, I found an affordably priced HTX-242 "new in box" (which is pretty cool, considering how old this radio probably is). It is a dandy! I'm guessing it's about 15 years old, but I don't really know. 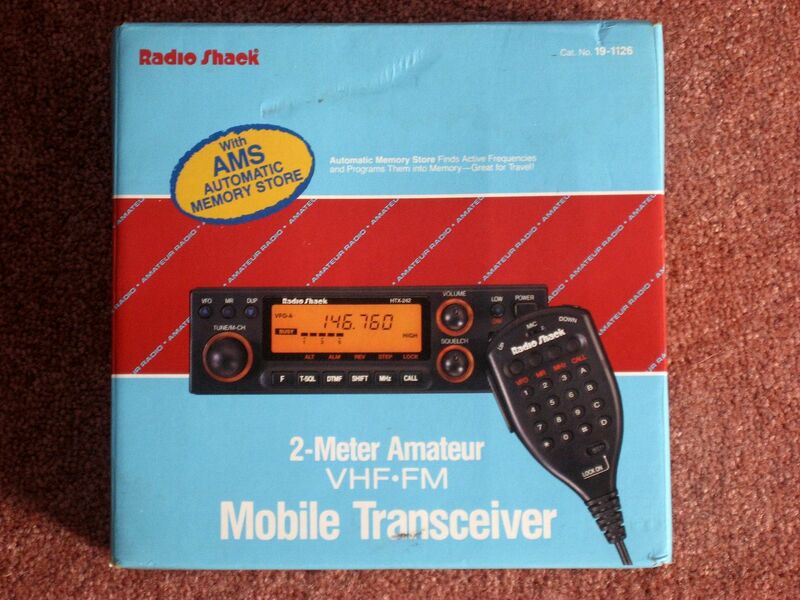 It's a throwback to the days when Radio Shack sold stuff that had to do with radios. Imagine! My friends at RASON tell me that part of the reason my signal is so good here is proximity to the water. 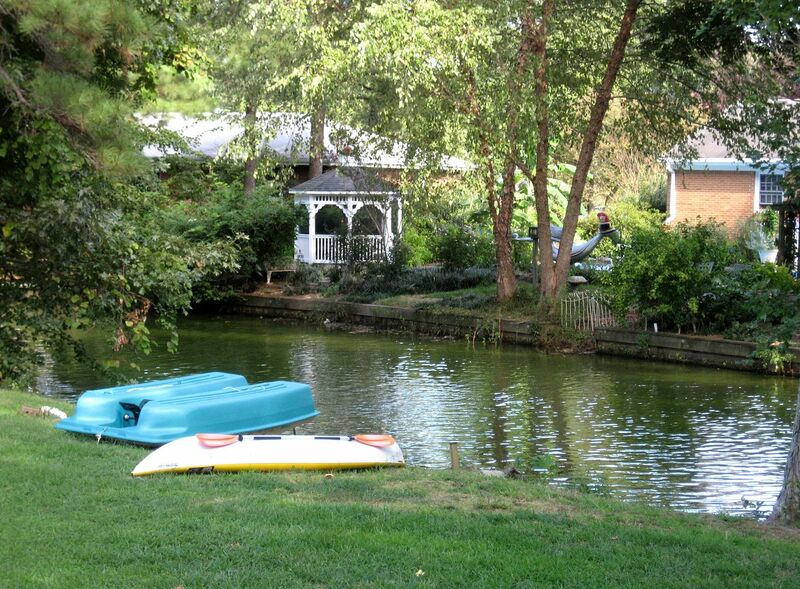 We live on a finger of Lake Whitehurst. And this helps with the good reception, too! Since this photo was taken, we've raised the antenna another four feet! To read Part I of this blog, click here. To read Part II, click here. To learn about the many pretty Sears Homes here in Norfolk, click here. About 18 months ago, I wrote a blog about passing the Technician’s test and obtaining my Ham Radio License. 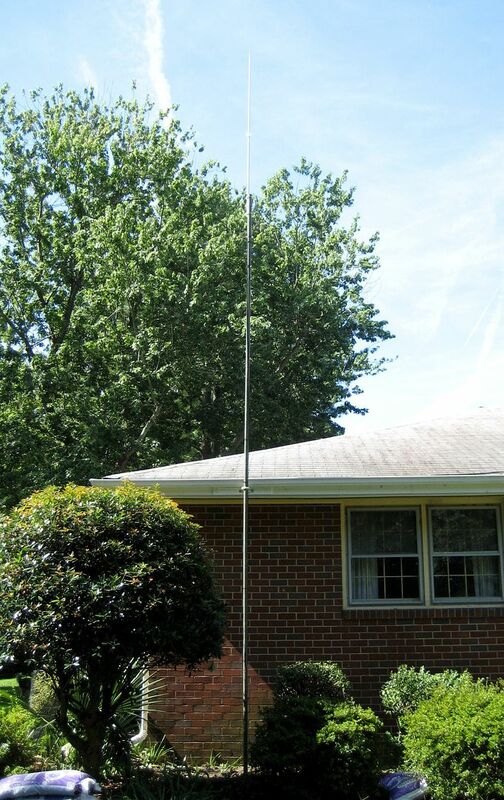 That was certainly a big milestone and today there was another one: I now have a beautiful eight-foot Diamond X-200A, a dual-band vertical antenna, proudly standing beside my house and reaching toward the heavens. Were it not for RASON (Radio Amateur Society of Norfolk), my ham radio license would be just another document, sitting at the bottom of a desk drawer and gathering dust. I can’t imagine trying to navigate the complexities and nuances of radio equipment and antennas and power supplies and grounding rods and frequencies and on-air etiquette and more, without the ongoing support, patient tutelage and constant guidance from these experienced members. 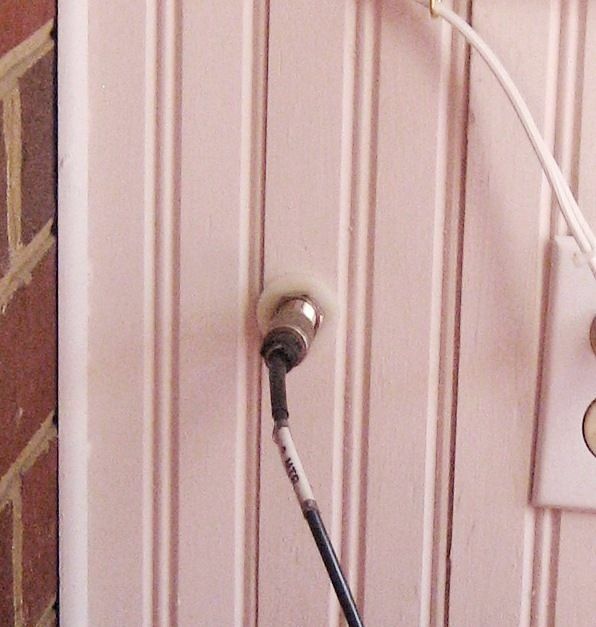 Based on my real-life experience and a little research, most Ham Radio operators are hyper-intelligent, well-read, sagacious and perspicacious male baby boomers who built their first ham radio from a Heath Kit in the 1960s. Generally speaking, I’m a smart cookie, but when it comes electrical systems, I’m a bit of a dullard. After procuring my first ham radio, (a hand-held Wouxun transciever), I needed help with a couple things, such as turning it on and turning it off. And changing from one frequency to another. 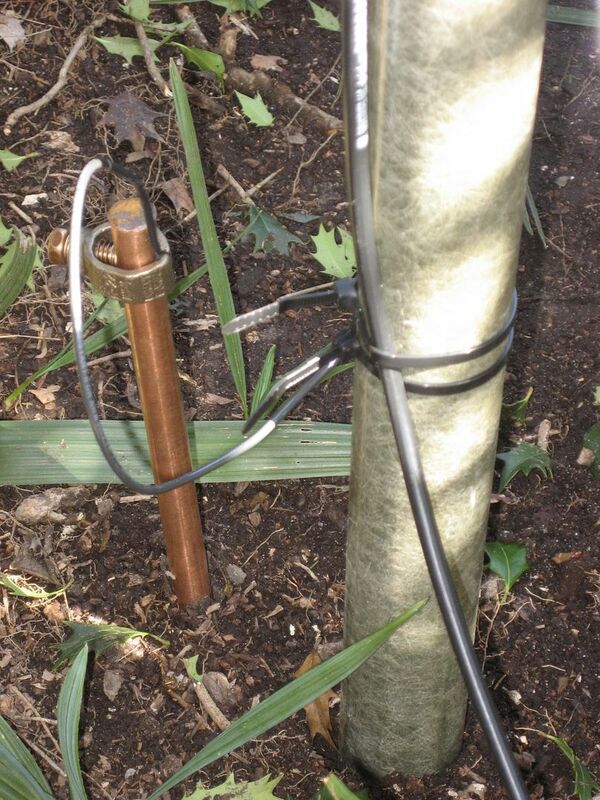 And plugging in the antenna. And removing the battery so it could be recharged. And putting the battery back after it was fully charged. And everything else. When I told RASON president Mike Neal that I was ready to put up a “real” antenna at my house, he graciously offered to help me with the whole project. And wow, did he help. 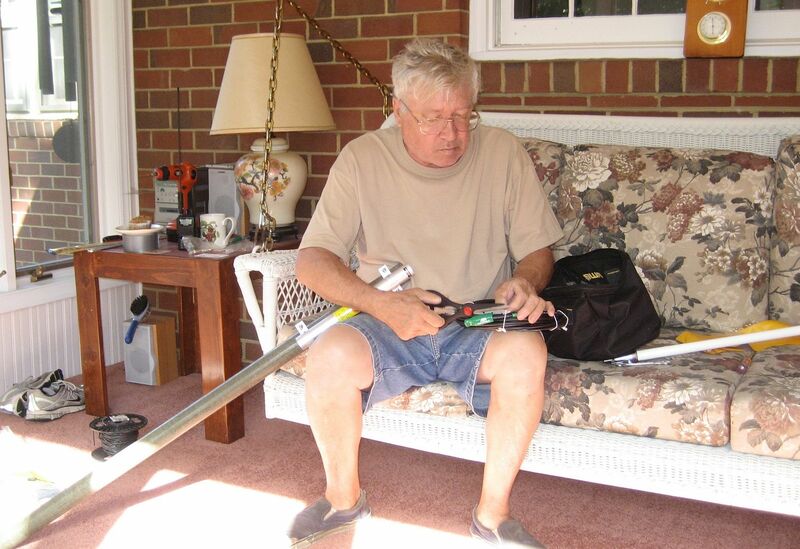 He provided specific guidance on everything from finding an ideal spot in the yard to measuring the length of wire needed for the new antenna, and he even provided me with a detailed shopping list, showing every piece and part I’d need. 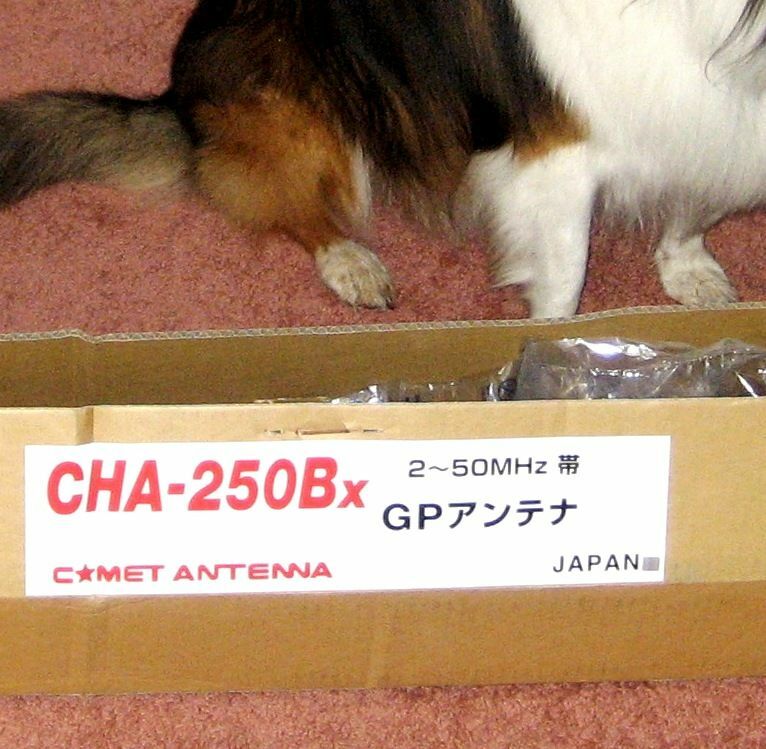 When the antenna and associated components arrived, I excitedly emailed Mike and asked him for help installing the new antenna. “Help” is an interesting word choice here. I watched in silent, reverential awe as this Japanese-manufactured mass of stainless steel pieces and parts and pipes was transmogrified into something resembling an antenna. The antenna is - in my humble opinion - a thing of beauty and a joy to behold. The signal it produces is strong and clear. Thanks so much to Mike and RASON for holding my hand and walking me through these very first baby steps as I enter the world of Ham Radio. The learning curve for a late-comer like me is massive, but I have a feeling it’s going to be a fun ride. I paid close attention as Mike assembled the antenna but most of it was a high-speed blur. Diamond Antennas should hire this man to create an online tutorial on how to put an antenna together because he makes it look so darn easy. And to us neophytes, it's not "easy." 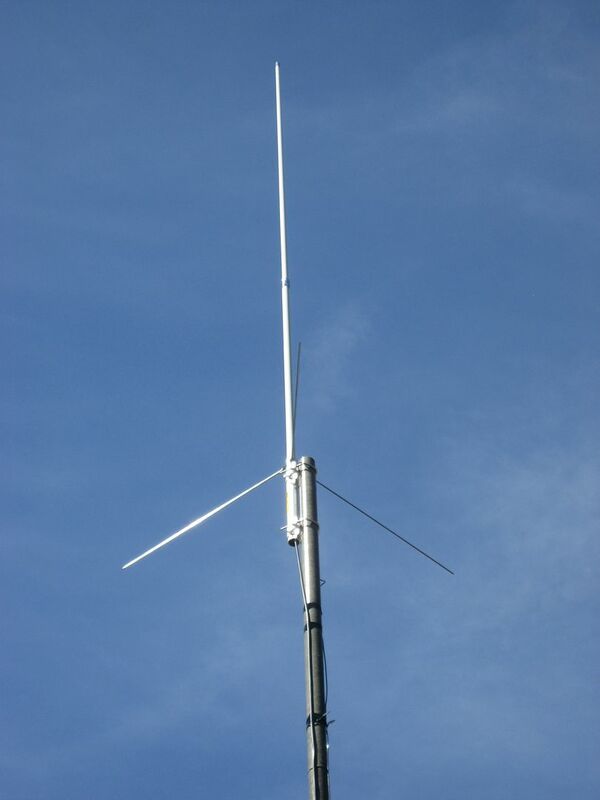 Here's a picture of the "stick antenna" I used prior to the installation of the exterior antenna. This magical little device was made (and lent to me) by RASON. With this little antenna (and my five-watt radio), I picked up Kilmarnock from my sunporch. According to Google maps, I'm about 75 miles from Kilmarknock. 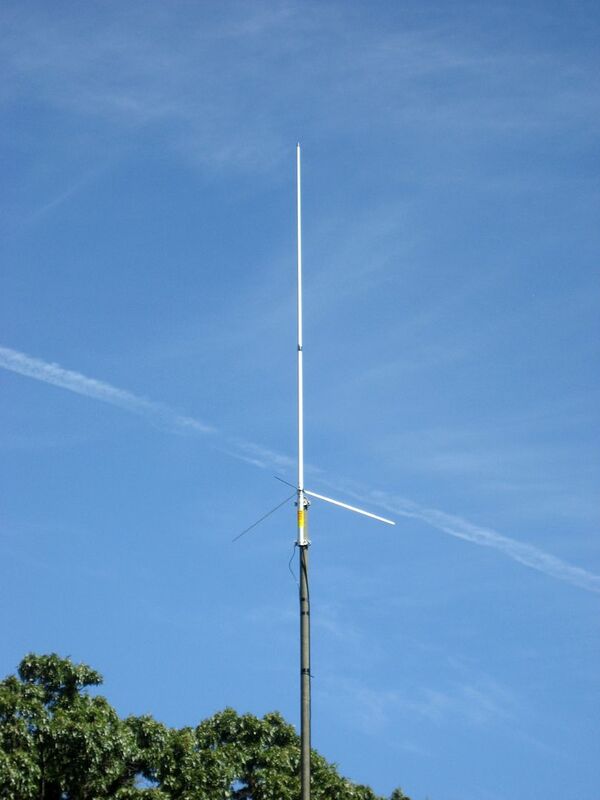 The mast that supports the antenna was purchased from eBay. 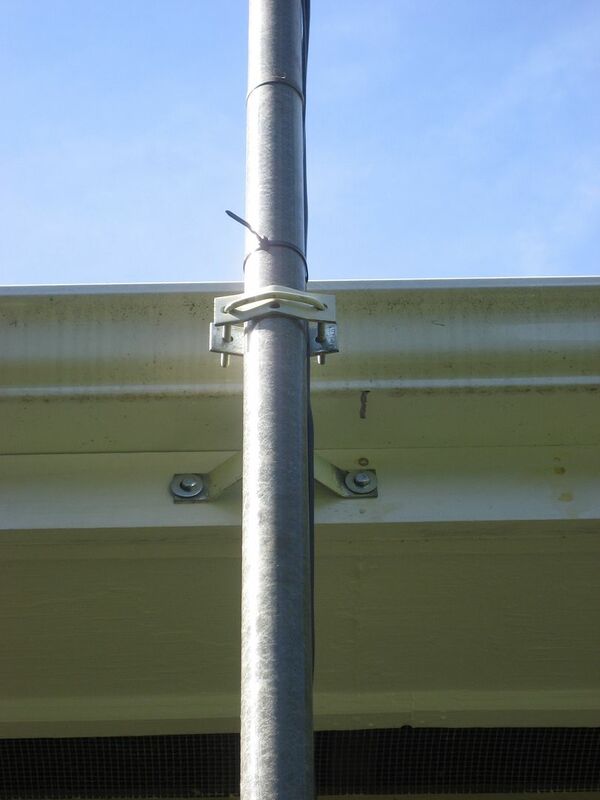 This mast is made up of several army surplus tent poles (fiberglass) and measure 40" per length. They're ideal for mounting Ham Radio antennas. Again, Mike and RASON were the source of this information. I have a vague memory that something about grounding rods was on my Technician License test. Fortunately, Mike's memory on this topic was better than mine. 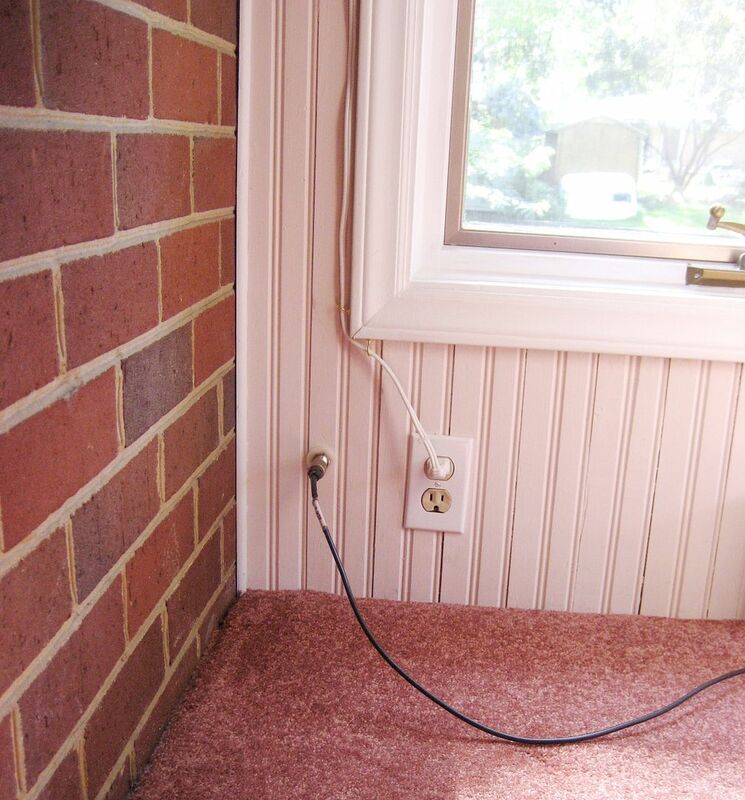 The antenna's connection point into my sunporch/radio room was very neat and tidy. A close-up shows how tidy this connection really is, thanks to Mike's supervision and guidance. Close-up of my "equipment," which is a Wouxun transceiver KG-UV6D. 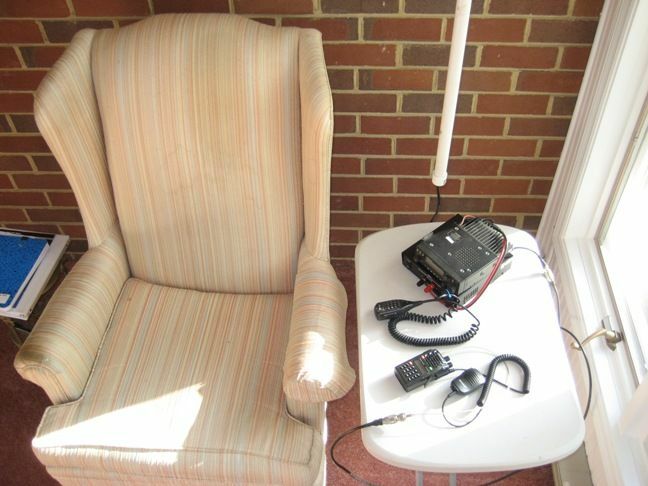 The wing chair is the official "Rosemary is playing with her new ham radio so please don't disturb her" chair. It's quite comfy. 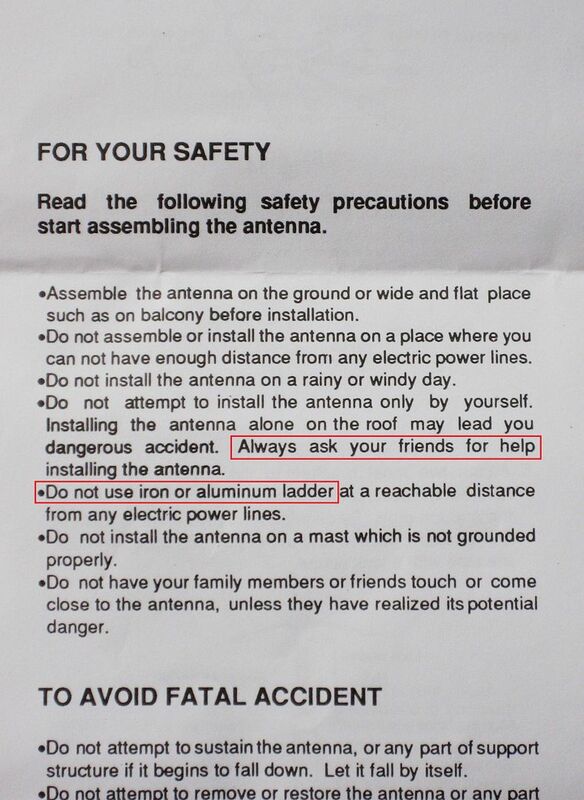 "Do not use iron ladder." Are those popular in Asian countries? Because I think they'd be pretty darn heavy. And the Japanese must be far more social than us Americans. Throughout the text, the phrase, "Ask your friends for help" appeared eight times. Apparently installing a Ham Radio antenna is a big social event over there. And now the beauty part: The antenna itself. I'm not sure how tall it is, but I think it's about 28 feet to the top of the antenna. That Holly bush (center of photo) may have given its life for this project. It was hacked down to 30% of its original girth to make way for the antenna installation. Another view of that dandy antenna. From the front of my house, this antenna is nearly invisible. Can you see it? To read part one of this blog, click here. 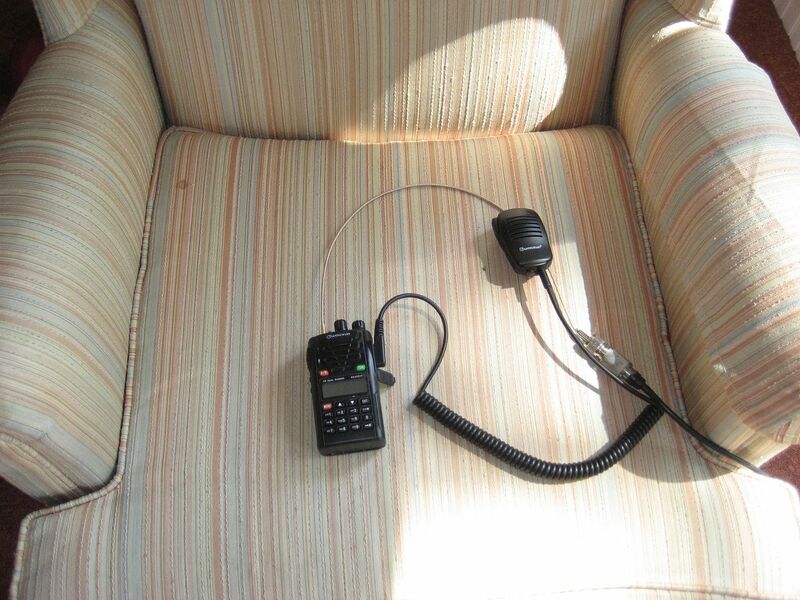 To learn more about Ham Radio, click here. Click here to learn more about Radio Amateur Society of Norfolk.